What does it mean to have a strong constitution? When someone refers to someone else as having a “strong constitution,” they usually mean that the person is of strong mind and body. They see that person as having a grounded, centeredness about them – a hardy, stable core and foundation, from which all else stems. The same can be said with regard to a country’s Constitution. 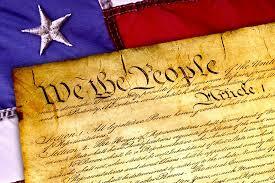 The United States (U.S.) Constitution dates back to 1787 and is the oldest formal national Constitution. Many constitutional scholars contend that this oath was explicitly spelled out in the Constitution precisely so that the Office of the President and the person holding that Office would be different from a King – in both power and structure. This was by design. The oath was memorialized in the Constitution to remind future presidents that they are not royalty. Presidents are not to “rule over,” but rather to act as servants of, the people. This oath was written into the Constitution as a safeguard to ensure Presidential restraint. As designed, the Constitution established a separation of powers among the three branches of government: the Executive, Legislative, and Judicial. The triangular form of government was built upon the foundational belief that no one branch should have authority over another. And specifically with regard to the Executive: The Presidential Oath was designed to serve as a reminder and explicit “internal check” on what would otherwise be unbridled power in the hands of a singular person at the helm of the Executive branch. It is important to note that the Presidential oath is the only oath that is spelled out in the Constitution itself. Having left behind a monarchy, our country’s founders felt strongly about limiting the powers of the President. “[T]he separation of powers frustrates designs for power and at the same time creates an incentive to collaborate and cooperate, lessening conflict and concretizing a practical community of interest among political leaders.”(Emphasis added). The nation’s founders desired that the members of our government work together on behalf of the greater good. Collaboration rather than conflict was the message of the day. So, what is one to make of it, when we now see such divisiveness within the federal government, and in particular with regard to what many contend is an irreverent, cavalier attitude and stark semblances of “king-like” behavior being displayed by our current President? -Resisting any limits on business dealings that raise potential conflicts of interests, as proscribed by the Constitution’s Emoluments clause (which prohibits public office holders from accepting gifts or monetary remuneration from a foreign state). While not the first or likely the last Presidential administration to invoke executive orders, the sheer number of them being signed so quickly at the start of a President’s Administration is nearly unprecedented. And, limiting and even excluding certain members of the press corps at the White House press briefings smacks of blatant disregard for the First Amendment. Traditionally, journalists and the news media have been considered to be a “fourth estate,” and as such are often considered to be another “check” on any otherwise untethered governmental power. Also, the current President has demonstrated complete disdain for members of the Judiciary. He openly criticized and scoffed at federal judges who, on Constitutional grounds, ruled against him on two of his so-called Muslim Bans. The past few months have been rather disheartening for me. I’m sure I’m not alone in this sentiment. In particular, I have been feeling as if the fabric of our Constitution, over and over, was being sliced to shreds. For me, the impact of recent news events and what’s being revealed about members of our federal government, extends well beyond political party lines and affiliations. It hits at the very core of our nation’s, and by extension the world’s, stability. The ultimate outcome of this Presidency, and of any federal investigations and the like, remain beyond the purview of this blog article. My focus and intention here, however, remains this: to shed some light on why all this matters. It matters to us here in the United States; and, it has worldwide implications, because: Put simply, unexamined and unchecked abuses of power are a threat to everyone. Carefully examined (ab)uses of power, however, are critical to the ongoing survival of our nation and the planet. The ever flowing tide of executive orders has noticeably ebbed. Journalists at the White House press briefings are literally and figuratively standing up to apparent obfuscations and inconsistencies in statements made by the Press Secretary on behalf of the Administration. Members of both parties less and less seem willing to simply “look the other way” with regard to potential or actual conflicts of interest, and other strains on our Constitutional safeguards. And, most recently, the appointment of a Special Counsel to oversee an investigation into the role, if any, that the Russian government may have played in the 2016 presidential election — and potential collusion by members of the Administration — sends a strong signal that unbridled uses of Executive power and influence will not go forever unexamined or unchecked. While the Constitution may have suffered a few incisions during the past several months, I’m comforted to see signs that they may ultimately have been only flesh wounds. The Constitutional net formed by the threads woven together by the framers more than two centuries ago remains strong. Throughout the various attempts to unravel it, the Constitution continues to hold it all! We do have a strong Constitution. It rests, as can we, on a solid foundation. And, its well-crafted weave keeps the bottom from falling out. That is, indeed, good news. What does a “strong constitution” mean to you? As citizens and constituents, what should we expect or even demand of our elected representatives? https://lanoonan.com/wp-content/uploads/2017/12/Logo-transparent-300x72.png 0 0 Lori A. Noonan https://lanoonan.com/wp-content/uploads/2017/12/Logo-transparent-300x72.png Lori A. Noonan2017-05-25 14:48:172018-02-22 18:10:15What does it mean to have a strong constitution?